JCECE Application Form (जेसीईसीई बीटेक आवेदन पत्र) 2017: Jharkhand Combined Entrance Competitive Examination (JCECE) 2017 will be conducted on 07th May 2017. The applications will be accepted in both Online as well as Offline mode. The submission of JCECE B.Tech Application Form 2017 will be started from 03rd April to 24th April 2017. The candidates who have completed their diploma can also apply for direct admission in B.Tech 02nd Year. 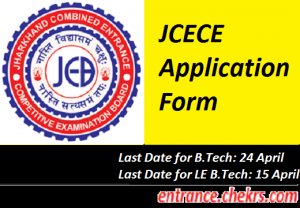 JCECE LE B.Tech Application Form 2017 will be accepted from 20th March to 15th April 2017. This exam is state level examination for undergraduate applicants’ admission. Only the candidates meeting the eligibility norms in all the aspects are invited to register themselves for JCECE. The entrance exam for JCECE B.Tech admissions 2017 will be conducted on 07th May and for B.Tech Lateral Entry on 30th April 2017. Its a great news for all those candidates who are waiting for the commencement of JCECE Registration Form 2017 submission. Candidates can fill the application in both Online as well as Online modes. For B.Tech regular entry, the JCECE B.Tech Application Form 2017 will be accepted from 03rd April to 24th April 2017. And for B.Tech lateral entry, applications will be invited from 20th March to 15th April 2017. Students need to open official Website of JCECEB, i.e. jceceb.jharkhand.gov.in/. You can apply in online as well offline mode. For applying online click on Apply link and for offline mode download the application form. Fill all the entries in the application form. Attach all the necessary documents and other attachments. Pay the required application fee in the suggested application mode. Click on submit button in case of online application. Submit the duly filled application form to the given address till the last date in case of offline application mode. Applicants who are seeking for the admission in JCECE classroom engineering program, they need to apply by submitting the JCECE Application Form 2017 either in online or offline mode. For JCECE B.Tech Registration Form 2017 submission, candidates have to meet JCECE eligibility criteria in all the aspects they have to submit the application form between the dates 03r April to 24th April 2017. Online applications for B.Tech lateral entry will be accepted from 20th March to 15th April 2017. Candidates are advised to either follow the steps or the direct link given above to apply for JCECE 2017. For any type of assistance, while applying for JCECE, you can contact us by commenting at the end of the post.